Mocks and murmurs softly, "Dreamer, come with me." "Purple, perfumed packages with memories for all." Drifting down the Dream path to the Country of Content. Vague, elusive memories, haunting, haunting sweet. Hushed the noise and clamor of the busy day. With drowsy dreams of lavender and quiet country rest. 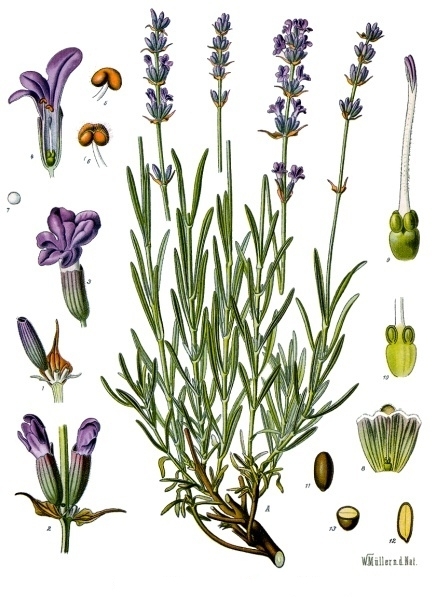 Lavender Absolute (Lavandula augustifolia) from France is a dark brown viscous liquid displaying a deep, rich, warm, floral- herbacous bouquet with a honeyed-coumarinic, delicate woody-resinous undertone. In natural perfumery it is used in citrus colognes, chypres, fougeres, new mown hay, forest notes, herbal accords, literary creations, sacred perfumes, incense bouquets, amber bases, green accords.